My first really Christmas-y moment last night. I had been out for a festive drink and was starting to make my way back home. I was walking to the station, taking backstreets and shortcuts wherever possible. 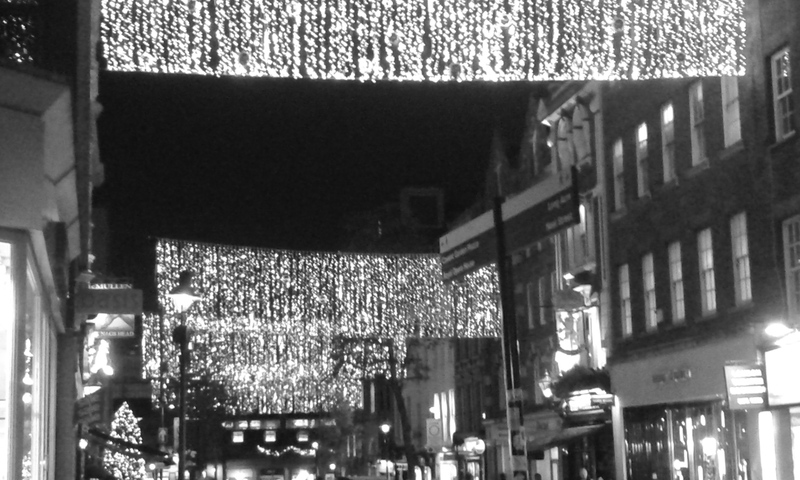 I then turned the corner and the street was glowing, with lights strung from one side of the street to the other. In my vaguely woozy state it was beautiful. I took a photo that seems a little woozy too, but the view doesn’t look quite as beautiful as I remember. I know Christmas lights can be clichéd, but I loved the simplicity of these, raising down towards the road. They weren’t tied in with a festive film, or obviously associated with some sort of other corporate tie-in. They were just pretty, perfect little lights, that got me at exactly the right time. I remember as a kid we would each year head up to London to see the lights. Those memories came flooding back. And it felt like Christmas was really on its way.